Jungle beats, rock and hip-hop..
Cabanas, daybeds and lounge chair. Rehab at the Hard Rock Hotel in Las Vegas has dominated the pool scene. 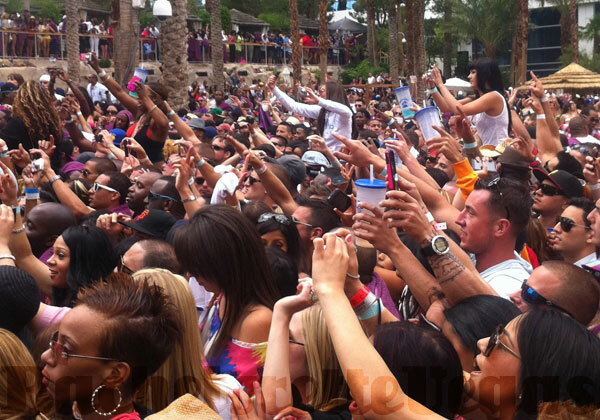 Since the introduction of Rehab Sundays, pool parties in Sin City have skyrocketed in popularity – attracting over 4,000 skimpily dressed bronzed bodies each weekend. Rehab has become legendary, being featured in The New York Times and from its transformation to a reality television show. Billed as the hottest pool party in Vegas with the hottest hunks, Rehab truly lives up to its reputation. If you are looking for a premier spot to host your bachelorette party, or just need a day out with your girlfriends, Rehab is the place to go. For about 20 Sundays each year, Rehab takes over the 4.7-acre pool area featuring two heated outdoor pools. Imagine sitting beneath one of Rehab's Tahitian style cabanas, which include cable television, a telephone, refrigerator, and fresh fruits and misters. This is the ideal location for any bachelorette party with a group of your best friends. Rehab is offers a multitude of amenities for guests. Sit back and enjoy a few drinks in the Jacuzzi tub with your girls or rent a raft, inner tube or other pool toy and have some fun in the water. Music is piped through an underwater sound system and a built-in dance floor is available in the party space for you and your party to let loose. If you feel lucky, try your hand at the swim-up blackjack table or play in the Palapa Hut. 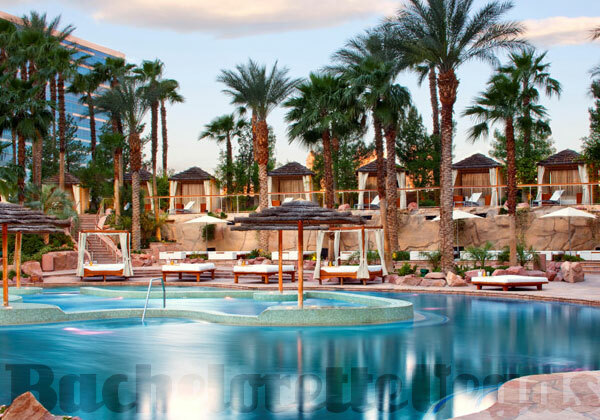 Each Sunday, Rehab takes over the pool area from noon until the sun goes down. During this time, guests will be treated to relaxing massages from Rock Spa, a delicious tray of exotic drink concoctions, and an appealing flame grill provided by Pink Taco. While the pool area is normally reserved for hotel guests, each weekend during the summer months, Rehab is transformed to one of the wildest parties on The Strip – getting its real deserved description of "spring break on steroids." When extras are thrown in, such as a two-hour performance by Lil John or a visit by a supermodel host, things can really get heated. Big name musical acts and top-notch DJs make frequent appearances, making Rehab the perfect way to end a hard work week in Vegas. Before getting too deep into the party scene, take a walk around the pool area to see all the things that Rehab at the Hard Rock Hotel has to offer. You'll see a waterslide that drops into a quieter pool area, a main bar that gives guests a break from the sun, and a nearby sauna, spa services, steam room and casino. If you need a place for you and your bachelorette party guests to sit, you'll have to spring for lounge chairs or a cabana. If you don't mind the busy atmosphere, consider fighting for a spot around the center pool. Ladies, as with most clubs, get some breaks. The cover charge is typically less for young women at $30 and if you meet the right people, you may find yourself with a cabana pass, sipping on free beverages. After soaking in the sun all day at a wild Rehab party, you and your girlfriends will be left wanting more of this one-of-a-kind pool party experience.